I'm starting this new thread here because I did not find another more precise to make known the progress of this new project. I took this afternoon to see if my "new" PAZ1 could be resurrected. The bad news: fuel tank with a huge hole. To do: disassemble the fuel line; improvise a temporary line (see photo - final version); bleed (+320 crank turns) the bubbles never stopped ... and finally it is alive. Next step: disassembly, sandblasting, straightening plates, primer and paint. Difficulties today: lack of English spanners. Once more improvising. I'll post the project advance. At some point I realized that transpiration wasn't enough to fulfil the task, therefore I took a break to inspiration (see foto). Please note the important is that I cannibalized my 10 year ago hidrolizer project, because it has the BSP right to fit the injection pump. Welcome sirpedrosa, and congratulations on the new project; considering it's age I would call it in great original condition. I too am a fan of the PAZ1, and it is certainly in better condition than any of the ones I have, especially the sheet metal and fuel tank. What are you planning on installing it on? By now it's only to make it pretty. After i'll figure something to it to run. This afternoon I changed the oil - there was some sludge in the bottom of sump. 3 lts (metric conversion) of good mineral oil and it runs smoother. I want to strip it down, but i need the workshop manual. I all ready ask help with this task. Please, if you have it in pdf format, send it. Can someone share the PAZ1 workshop manual? Please. 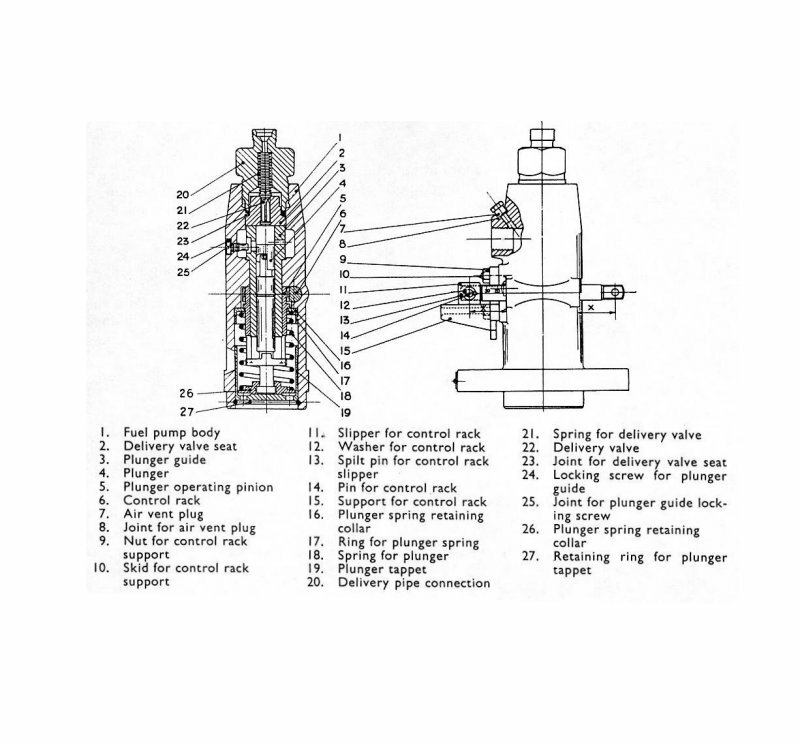 Another good question for the comunity: does anyone know how much tightening torque of the "delivery pipe connetion"
NOT very tight if it's a flare fitting . Finger tight, and then just a tiny bit more. The shape of the fitting is what seals, not the torque of the nut. Too tight and you ruin the fitting. Again, it's the shape of the metal-metal interface that seals, not jamming the nut on super tight. The IP creates high pressure, much like brakes in a automobile. Steel brake lines also use this sort of fitting, but since it's harder steel, it's more difficult for DIY at home, often it's easier/safer/reliable to but the pre-shaped line. Many thnks for reply, but is not that torque I mean. It's the (20) tighten in the body (1). It took some strength to unscrew it, I say quite a bit. the body BRYCE is Aluminium. Now I need the toque limit to tight. Does anyone have the Bryce model NSDLA052D0359 injector manual? Fuel pump rack extention - stop overload arrives from UK. Some cleaning, new oil, bledding, a dozen o crank turns and it fireed up. Now I'm this cross, I want to go with both along - but this one when it reach the "normal" duty RPM starts to shake. Good advice will be very aprecciate. I'm reading an interesting book at the moment about the British aircraft industry from 1945 till the mid 60's when it was basically finished, lost the plot. The Petter family, who made your engine apparantly also started the Westland Helicopter company. Teddy Petter became English Electric's chief designer, and was pretty much totally responsible for designing the English Electric Lightning, one of Britain's most successful planes of all time. Can't remember offhand, but from take off to 50 000ft took something like 2 minutes. Could only stay airborn for 40 minutes, then needed to find a tanker or land fast. I had made some digging on Petter's history, and there are several inventors and engeniers that made some spinoffs to their first company. As you see Lister has clones in India, and so on. It's the price of time.